If you have no animals in this hunt, like me, it’s hard not to see why the Cougars, at this point in the Apple Cup’s century-long saga, richly deserve a triumph. Regarding the Apple Cup Saturday, I’m neither canine nor feline. Did a little grad work at the University of Washington, but I don’t have a rooting interest based on where I squandered my tuition money. My adult rooting interest in any game always has been based on a professional tenet: If I am moved at all to cheer (which happens as frequently as every Ice Age), I cheer for a good story, regardless of laundry color. Based on that, as well as the notion that Washington State truly needs (not wants) this one: Go Cougs. Four reasons the Cougars are the better story. As colleague Steve Rudman pointed out earlier this week, only twice in the previous 109 meetings, in 1981 and 2001, have the programs entered the annual disputation with fewer than four combined losses. The infrequency of top-15-caliber records in the game is due largely to the Cougars’ historic inability to field premium teams on a steady basis. The biggest part of that problem was an inability to recruit defensive talent equivalent to the aerial gymnasts traditionally hired to operate the WSU offense, a condition that long pre-dates the time of coach Mike Leach. But despite injuries that have taken away stalwarts, including star LB Peyton Pelluer, the defense coached by Alex Grinch is ranked 11th in the nation and second in Pac-12 at 303 yards allowed per game. The contradiction with history is bewildering and unprecedented, like watching Danny DeVito win a barroom brawl. 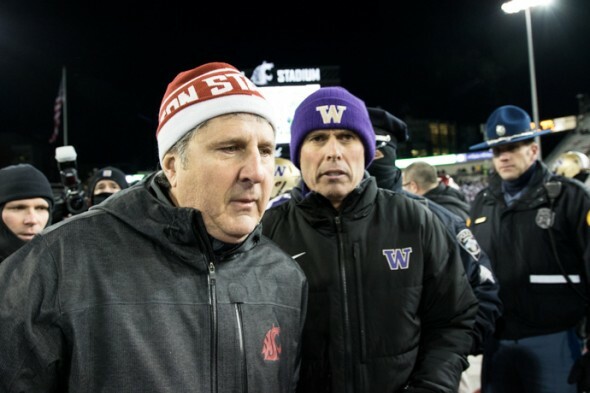 “Since Mike Leach has been there, it’s always been about that offense, and everybody knows how prolific they are,” UW coach Chris Petersen said this week. “That hasn’t changed. The thing that has changed is the type of defense that they’re playing. It’s impressive. They do a great job. You think you have (the defender blocked) or you have this gap, and then there’s nobody in your gap and you need to redirect. This defense represents the best chance in years for an upset by the Cougars, who enter as 10½-point undercats. If they don’t get it done this time, when? The past four meetings have been lost by a combined score of 148-57. If the Cougs can’t take advantage of this defense, a bye week for additional prep and a UW offense diminished by injuries, they may as well let new university president Kirk Schulz pay the large athletics department debt with lemonade-stand sales. The best rivalries always have stakes and a history of upsets. If the Cougars win, they make their first appearance in the Pac-12 championship game, succeeding defending champ Washington, which Saturday is stuck with the Cougars’ traditional participation-trophy role as spoiler. WSU would face a USC team they beat 30-27 on a raw September day in Pullman that Cougars fans saw as beach weather. Historically, a win Saturday comes on the 20th anniversary of the Cougars’ 41-35 win at Husky Stadium, probably the most significant WSU win in the series. Led by notorious QB Ryan Leaf, the 41-35 triumph sent the Cougars to the Rose Bowl for the first time since diamonds were coal. It’s also the 25th anniversary of the second-best Cougars win, the Drew Bledsoe-led Snow Bowl triumph in a Palouse snowstorm that was UW coach Don James’ last conference game. But the here-and-now is the best angle: Despite two egregious conference losses, 37-3 to Cal and 58-37 to Arizona, a win Saturday opens the chance for a WSU season that includes wins over Stanford, Washington and two over USC. The National Guard would have to air-drop into the Palouse emergency supplies of Jagermeister. The Pullman population in 2016 was listed as 33,282, or about what Amazon hires into Seattle on a Tuesday morning. Many of the newbies come from out of the state, out of the region and out of the country. They have no notion of what the Apple Cup is about. Why should they? Since the time Amazon began swallowing Seattle, the Huskies have won seven of the past eight Apple Cups, and the only loss was in overtime. Why would newcomers comers find such lopsidedness compelling? The value in getting Amazon’s developers and engineers charmed by this quaint custom among the local primitives would be to solicit their help in finding a technology solution to the biggest crisis in Apple Cup history: The unavailability of trash talk. Leach, the self-styled Pirate, and Petersen, nicknamed the Bishop by Leach for his fastidious propriety, have almost nothing in common personally but do share one annoying habit: A virulent disdain for allowing players their voices publicly, including social media. Each has been successful in dropping cones of silence over their players, robbing the rivalry of oral invective, insults and humor. What this series needs is a device that secretly records the private chatter on both sides and airs it on a YouTube channel, subverting the coaches, school propaganda websites and the Pac-12 Networks. A former walk-on and now the Pac-12’s all time leading passer as a fifth-year senior, Washington State QB Falk has put up with so much from Leach and an often vulnerable offensive line. With a career total of 117, he’s been sacked more times than the capitals of Asia during the Mongol Empire. No one in this game deserves to win more, not just for the result, but for the right to slap his coach. Thanks Art and Happy Holidays! Reason #4 is Number One for me! Gotta love to hate Leach, much the way Charles Barkley was to the SuperSonics when he was in the division. Except that Leach comes from another planet – a lone survivor of an otherwise extinct race. He is definitely out there. I hope he stays at WSU a long long time. A better and more controversial WSU makes for a better rivalry and a stronger North. Amazon influx – I don’t enjoy Husky home games like I used to. Too many newbies and the temperament of the crowd is not what it used to be, when I was proud to be a sports fan from Seattle. So we’ll be enjoying this one from home. I like your score, tight game, but (hope to) see it flipped with the Huskies dominant rushing attack. GO DAWGS! The rumors of Coach Leach following Bill Moos to Nebraska are slowly building which is sad for WSU. If he does leave that could set the program back for years. Again. WSU did a huge mistake letting Moos leave. This could very well be the Cougars last chance. Scott Frost (Central Florida) is undoubtedly first on the list…..a Nebraska resident and alum, young, innovative offense, and an aww-shucks Nebraska attitude. He belongs in Lincoln. I’m predicting he goes to Florida unless Willie Taggart takes it. Without emotion of my being a Husky alum, since the UW cannot win the PAC-12, I say what the heck, better that WSU win and then beats USC – ANYTHING to damage USC’s recruiting helps UW in the long run. With Chip Kelly now at the perennial under-performer UCLA, UW will see many FEWER top recruits from SC – BUMMER. The best recruiting years for the UW from SC are when USC and UCLA have lousy coaches.Ted Tollner and Larry Smith were special delivery gifts from God for Don James. Would a Red Sox fan EVER root for the Yankees? Ever? For one who also was not born to bleed purple, the fact that only the Cougs have a shot at the championship game is the decisive factor — even though a Huskies win would put my alma mater into next week’s playoff. Also my hunch, for what it’s worth, is that Leach stays at WSU and Nebraska nabs Scott Frost. I suspect Leach is smart enough to know that his flakey act plays better in the boondocks than under constant bright media lights. Apple sauce, Art. My Cougs have laid an egg the last three Apple Cups. I can only hope, indeed wish for a Cougar win. Leach hasn’t proved the Air Raid can play well against the dawgs. Go Cougs. Ooops. And it wasn’t as close as the score indicated. This is what happens when a prediction reflects what the predictor wants to happen, whether for fandom or for journalism.